Buffalo wings are a crowd favorite. 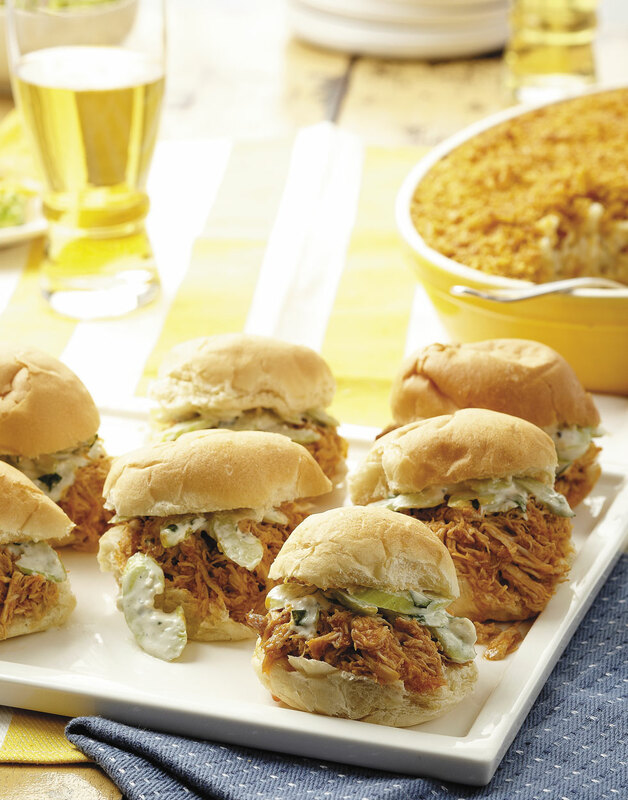 With these Buffalo Chicken Sliders you get all the flavor of the wings, but without the mess. Prepare the chicken and the components for the slaw up to a day ahead. Dress the celery just before serving so the slaw doesn't get too watery. For the sliders, combine onion powder, granulated garlic, and celery salt; sprinkle over chicken. Sear chicken in oil, in 3 batches, in a sauté pan over high heat until browned on both sides, adding more oil as necessary, about 20 minutes total. Transfer chicken to an 8-qt. slow cooker. Sweat onions, carrot, and celery in 1 Tbsp. butter in same pan over medium heat until softened, 3–4 minutes. Deglaze pan with broth, scraping up any brown bits. Transfer mixture to slow cooker and pour 1⁄2 cup hot sauce over the top. Cover slow cooker and cook chicken until fork-tender on high setting, about 2 hours. Transfer chicken to a cutting board and shred. Strain liquids from slow cooker; discard solids. Return chicken and strained liquid to slow cooker. Melt 4 Tbsp. butter and remaining 1⁄2 cup hot sauce in a saucepan over medium heat; stir into slow cooker. Set slow cooker to warm and heat chicken 30 minutes more; season with salt and pepper. For the slaw, process mayonnaise, sour cream, blue cheese, vinegar, Worcestershire, and Dijon in a food processor until smooth. Toss celery and parsley with dressing just before serving. Serve chicken on buns topped with slaw. Searing adds flavor to the chicken and leaves bits in the pan that contribute even more flavor. Shred the chicken with two forks, then return to the slow cooker to allow the flavors to come together.